There is evidence of human settlement in and around the area of Hoar Oak Cottage from prehistoric times. The Devon County Historic Environment Records the remains of a ring cairn, a barbed and tanged arrowhead, a post medieval water meadow systems and an abandoned medieval building. It is the latter which became a small, semi-permanent shepherds cot during the 1700s and which subsequently grew into a more substantial farmstead called Hoar Oak Cottage. The cottage is now abandoned and being conserved as a heritage ruin for people to walk to, visit and ponder on life in this remote spot. The Friends of Hoar Oak Cottage study and share the history and heritage of the cottage and its inhabitants from the 1700s onwards. The cottage is located in a remote part of Exmoor in the valley of Hoar Oak Water. It can be found at Co-ordinates SS740435 on OS Map Explorer OL9. 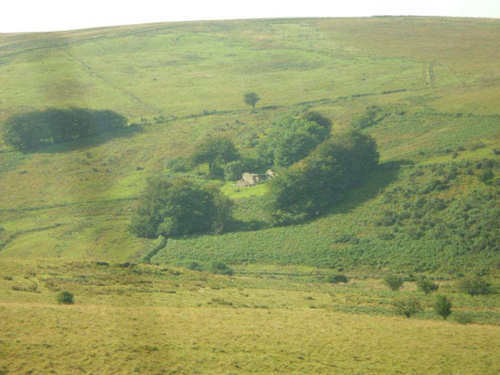 The cottage is cut into the valley’s western slope which leads ultimately up to the Chains – the bleakest part of Exmoor. To the east, north and south is high moor and river valleys and headwaters of the River Exe. The area is notoriously wild and boggy with rock overlain by layers of acid peat which has in the past been skimmed off into shallow, square turves and dried for fuel. Otherwise, the area is covered in poor moorland vegetation. There are no roads to Hoar Oak Cottage and it has never had electricity, water, sewage or gas services. The isolated and unspoilt character of the area has resulted in the cottage now being in the middle of a designated Dark Sky Area. The juxtaposition of people and place within this landscape provides the fascination for this particular One Place Study. At least 15 recorded families lived in Hoar Oak Cottage since 1790 and it is interesting to wonder how did people live and work in this remote place? Hoar Oak Cottage sits in the upland heart of the ancient Royal Forest of Exmoor, an area used, since medieval times, as summer pasture for herds of sheep brought up from the lowland farms. The Forest Books of 1700 record these sheep movements with notes made of numbers going onto the moor; numbers coming back and of lambs born during the summer. The particularly remote nature of the Hoar Oak herding would require the presence of a shepherd on a more permanent basis over the summer and the original small shepherd’s cot would have fulfilled this function. During the mid-17th Century a branch of the Vellacott family in North Devon, bought up large amounts of land in and around Lynton and the Tithe Apportionment for Lynton of 1839 shows John Vellacott owning and farming the Hoar Oak apportionment which comprised 389 acres including two large blocks of ‘Mountain’, 140 acres and 146 acres in extent, which would of have been suitable only for rough grazing. The influence of the Vellacotts on Hoar Oak Cottage cannot be understated. They were a large and expanding local family and we know that one son, Charles Vellacott, moved to Hoar Oak Cottage at the end of the 1700s/early 1800s as a newly married young man and there he and his wife Elizabeth had several children. Throughout the first half of the 1800s, the Vellacotts often used the cottage to house young couples – some family members, some employees –and as a consequence, during the early 1800s the small shepherd’s cot was added to in order to house these families of around 3 to 5 children. Residents during this period include Vellacotts, Dovells, Moule, Bale, Rawle and Richards – all recognisable North Devon families. Although we can guess architecturally how the cottage looked at that time the photo below is of another similar cottage which we are reliably informed is how Hoar Oak Cottage looked by the early 1800s. In the early 1800s John Knight, a wealthy Midlands industrialist and MP for Worcester, purchased the Royal Forest of Exmoor from the government and began his great Exmoor agricultural experiment – sometimes referred to as The Reclamation of Exmoor Forest. The impact on Hoar Oak Cottage was that during this period it became the home to a succession of Scottish shepherd families. One of Knight’s agricultural innovations, influenced by advice from his Scottish wife, was to introduce hardy Scottish sheep to try and improve the stock and to enable them to be kept all year round on the high moor. Along with the sheep he brought Scottish shepherd and their families to Exmoor, importing their expertise and ability to deliver his aims. Although the Knight family never owned Hoar Oak Cottage they did own much of the land around it as a sheep herding and so they leased the cottage to house the Hoar Oak shepherd families. This would bring the end to seasonal summer grazing and the start of an extraordinary and ultimately failed experiment, to make man, land and sheep do what was, in effect, impossible to do. Mineral and ore mining – an old Exmoor economic activity – was also investigated by Knight who was searching for potential income from deserted mine workings which might be made once again viable – including reopening the Hoar Oak Ore Mine. This too was sadly, another failed attempt to boost the moorland economy. The roll call of Scottish shepherd who travelled down to live and work at Hoar Oak Cottage include Davidson, Johnstone, Renwick, Jackson and Little. The Scottish shepherd families left a real legacy of shepherding on remote Exmoor as well as many descendants – families of up to 13 - who are now very much part of Exmoor life. 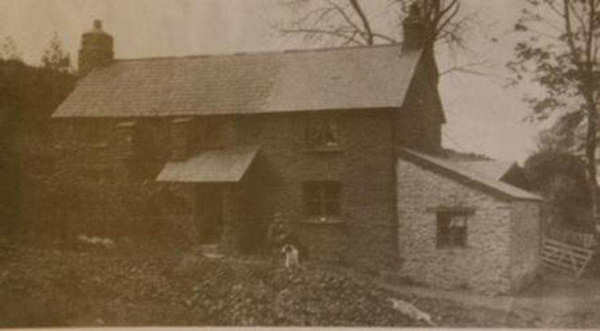 During this period the cottage grew substantially and by 1903, as shown in the photo below, was a substantial farm with a large farmhouse-style kitchen, a parlour, 3 bedrooms upstairs, lean-tos, dairies and large outbuildings to house a cow and a pony and to shelter sheep and lambs in bad weather. This picture of James Maxwell Johnstone was taken in front of Hoar Oak Cottage in 1903. He and his wife Sarah had 13 children at the cottage. When the Knight experiment came to an end much of the Exmoor estate and the agricultural activity associated with it reverted to the Fortescue family who have a very long association with Exmoor. They have many tenanted farms throughout the region and Hoar Oak Cottage was, from the early 1900s onwards, used to house the Fortescue shepherds working the Hoar Oak herding. It was occupied by young families from two old Devon families - Hobbs and Antells - and one who were descendants of the Scottish shepherd families – the Littles - who had chosen to stay and make their homes in Devon. The skills and knowledge introduced by the Scottish shepherds stayed in the region and continues to influence sheep breeds and practice for Exmoor hill farmers. During this period the cottage changed again, suffering terribly from damp and, as shown in the photo below, was faced with rolls of black tin to keep the damp out. 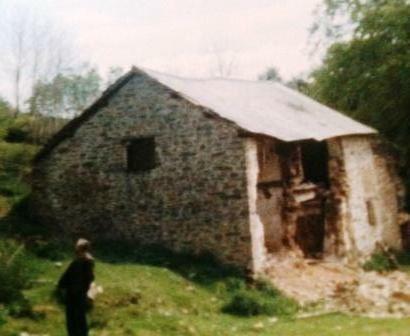 The lean-to on the right of the picture, once used as part of the house was boarded up and became home to one or two pigs – raised by the shepherds to supplement their food supplies. Families were smaller, two or three children at most, and the families would move away when the children needed to be nearer a village for schooling. 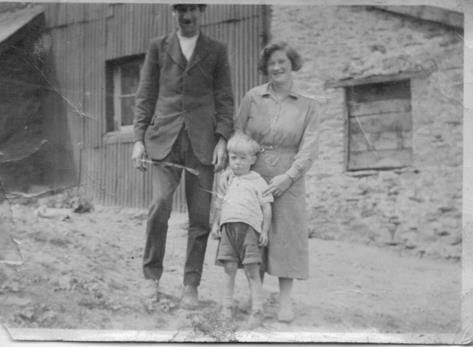 Shepherd Little, wife Dorothy and young son David around 1930. During the 1950s the introduction of National Park Authorities led to certain geographical areas – including Exmoor – to be taken into the care of public ownership. 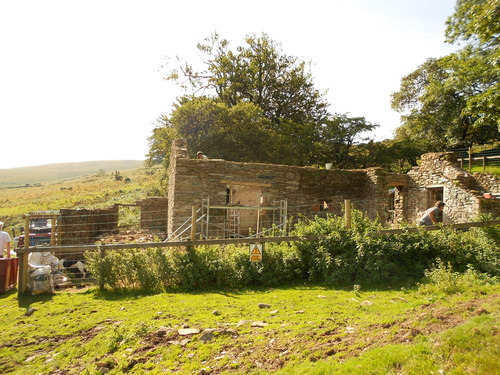 Around this time Hoar Oak Cottage and the 25 acres around it were purchased by the new Exmoor National Park Authority (ENPA) and taken into public ownership and ENPA care. The last Hoar Oak shepherd and his wife Abe and Gert Antell were removed in 1958, the land re-let as an agricultural tenancy to a nearby farmer including the cottage to be used as an outbuilding. At that time the ENPA removed the slate roof and replaced it with tin, demolished the interior structures and left the cottage to the elements. Despite this it remained standing and in reasonable shape for many years up until 2013 when the ENPA began conservation works on the cottage which has involved further demolition and stabilisation of the cottage structure with the aim of conserving it as a preserved ruin. Through the work and efforts of the many Hoar Oak family’s descendents and The Friends of Hoar Oak Cottage the building is being conserved as a heritage ruin and The Friends are researching and making public its history and heritage and stories from the many families who once lived and worked there. It is becoming a focus for anyone with an interest in local history, in moorland walking, in the Exmoor shepherd families or simply an interest in exploring bygone lifestyles. The Friends reach extends to descendants as far as Papua New Guinea and Northern Saskatchewan and as close as Lynton and Barbrook just a few miles away. Hoar Oak Cottage Sept 2013 at the end of the conservation working season. Although living in such a remote spot, the inhabitants of Hoar Oak Cottage were part of a vibrant if isolated community comprising other shepherd families on the high moor and through their links to the nearby farms connected to the villages of Brendon, Barbrook, Lynton, Simonsbath, Challacombe. Deliveries of post, sacks of flour, meat and veg etc would be left at one of these farms and the Hoar Oak men and women would ride across the moor on a pony, and sometime cart, to collect them. They would often take with them rabbits snared on the moor to be left for the butcher to pick up – a welcome source of extra income. 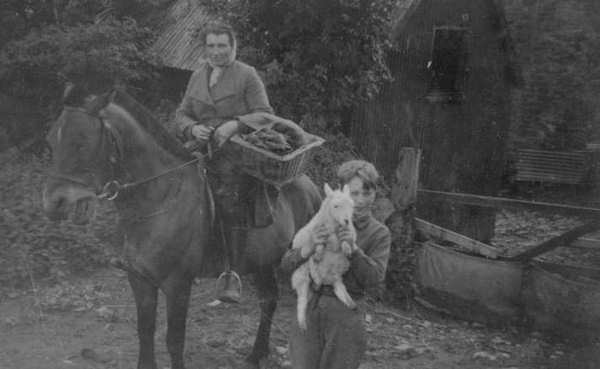 The photo below shows Gertie Antell, the last Hoar Oak housewife on her pony ready with her basket ready to ride to Cheriton Farm – a nearby farm which is on the road from Barbrook but near to the edge of the moor - to collect her shopping. Her little son Edwin is shown with a lamb. The Scottish shepherd families are particularly remembered for building up a close community – not unsurprising when research has shown that so many of them were either related or came from the same villages back in Scotland – but they also integrated into the existing community life. The men worked together, sharing their shepherding skills and labour especially at shearing, lambing and market time. The women helped each other out in a myriad of ways including at times of sickness and childbirth and the children grew up helping with farming duties, family duties and getting their schooling through home tutoring. Even when church and/or national schools were set up in the nearest villages children would have to board out with a village family and the school records show their attendance was hugely affected by weather, ill-health and having to help out back home with lambing, planting, harvesting etc. The community all came together at shearing time in particular – the shepherd equivalent of harvest – when the men would work long and hard hours and the women would provide food and drink and create a festive get together. Attendance at church was not easy and would, as with school, require the Hoar Oak Cottage families staying overnight with friends or relatives in the village. There was a well attended Methodist Chapel in Barbrook but the Brendon, Simonsbath and Lynton C of E Churches served for weddings, baptisms and burials. The nearest Doctor was in Lynton and stories abound of the shepherd riding his pony across the moor in the dark and snow to fetch the Doctor to a women having difficulties with her labour. The Doctor also travelled by horse as the only other option was by foot. One Hoar Oak shepherd, John Renwick, sadly suffered symptoms which saw him removed to the Bridgewater Assylum and his wife and family repatriated back to Scotland. Possibly the most important institutions serving the Hoar Oak shepherd families were The Rockford Inn and the Staghunters Inn. The shepherd and sometimes his wife would ride across the moor on the pony to these warm and welcoming pubs and, as so many stories tell us, it was often the pony who had the responsibility for getting the cottagers safely home again, late at night and across the open moorland. Hoar Oak Cottage families can be characterised as either a) never travelling far from North Devon and establishing tightly interwoven and intermarried family networks in the local community or b) arriving on Exmoor from as far away as Scotland and leaving to go to far flung spots such as New Zealand, Australia, Canada and the United States. As described above, the economic imperative of the Knight experiment on Exmoor brought many Scottish migrants to the area. Likely to have been recruited at the May Hiring Fares at Hawick Market, some would travel by foot or horse from Dumfries or Lanarkshire in Scotland and driving herds of sheep with them. Some combined transport by rail, boat and foot travel to achieve the same ends. We know of Scottish shepherds returning to their homeland, to visit ailing parents or to check out agricultural conditions back home and travel would be by train from South Molton, or later, Barnstaple. The agricultural economy was rarely booming on Exmoor and as a consequence many of the young men, some with new wives would, from the early 1800s throughout the 1900s, take their skills with sheep and horses to find new lives in the developing areas in the old British Empire. Their descendants and legacy can still be found in all of these countries as well as further afield. A sadder migration was of young men leaving Hoar Oak Cottage in World War One and World War Two never to return again or, if they survived, never to be the same again. A wide range of resources are being used for this One Place Study including: documentary research, photographs, oral evidence, parish registers, school record books, census returns, newspapers, archival material held in the Devon Records Offices and these can all be found on our website http://www.hoaroakcottage.org/. Hazel Eardly-Wilmot, Yesterdays Exmoor, 1989.